Kiteboarding off of Long Cay in the Admiral Cockburn Land and Sea National Park, Turks and Caicos. The cliffs of Long Cay in the Admiral Cockburn Land and Sea National Park. The Admiral Cockburn Land and Sea National Park is an expansive marine and terrestrial protected area off the south coast of South Caicos. 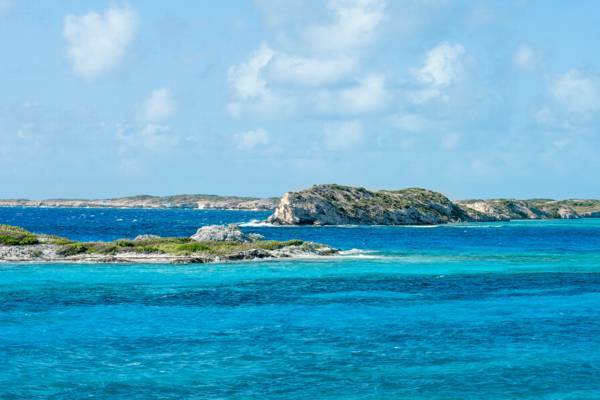 This 480 acre (1180 hectares) national park includes a small portion of South Caicos and the small uninhabited cays of Long Cay, Six Hills Cays and Middleton Cay. 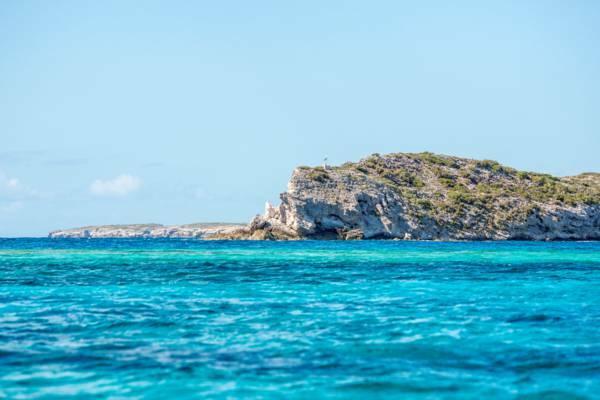 Many of the top South Caicos SCUBA diving and snorkelling sites are found inside the national park, along with the beaches of East Bay and Shark Bay (Gannaway Bay). South Caicos generally does not see a great number of visitors, and hence doesn’t support any dive or snorkel tour businesses. Because of this, the majority of guests are stopping over on a day trip, tend to stay on dry land, and only experience the national park as an incredible view from the hills and bluffs of South Caicos. South Caicos certainly doesn’t disappoint when it comes to grand vistas. In addition to the national park, the eastern Highlands Bay offers majestic rolling coastal hills, and Plandon Cay Cut and Bell Sound, found at the far northern point of the island, feature unbelievable shades of blue and turquoise ocean water. The semi-lithified marine limestone dune environment of Long Cay. The Admiral Cockburn Land and Sea National Park supports a vibrant barrier reef system that abounds with wild life. There are large numbers of colourful fish, turtles, eagle rays and sharks to see, and the reef terrain tends to be a bit capricious, with gullies, small caves and slot canyons. This protected area and the counterpart Ramsar Nature Reserve wetlands site play an important part of maintaining and replenishing the wild conch and fish populations in the Caicos Banks. As is likewise the case with the nation’s capital of Cockburn Town on Grand Turk, and the main settlement of Cockburn Harbour on South Caicos, the Admiral Cockburn Land and Sea National Park is likely named in honour of Sir Francis Cockburn, governor of the Bahamas from 1837-1844. At the time, the jurisdiction of this governorship oversaw the Turks and Caicos, and consequently he was involved in the management of the Turks and Caicos. It’s interesting that this protected area includes the name of Admiral. Sir Francis Cockburn’s better-known elder brother, Admiral of the Fleet Sir George Cockburn, appears to have had no connection to the Bahamian or Turks and Caicos regions, unlike Sir Francis, who played an important role in the developing islands and salt industry. Perhaps historical confusion between these two brothers lead to the name, or the title was intended to honour the part the Admiral played in building the British Empire. As in any protected area in the Turks and Caicos, littering and any type of fishing are prohibited. Removal of any natural objects or historical artefacts is also illegal.